A strange movie that really captures a period of a boy’s life through mostly interesting conversations and situations. This is a movie of a boy growing up through a period of ten years or so, and we actually follow the same set of actors for that time period, watching the kids grow and age as we go along. The experimental angle is cool, but the story doesn’t seem to have a plan or agenda and that often gets a little frustrating. The structure of the movie is basically a series of short stories, and some of them work while others don’t. There are very few problems and resolutions here, and in no way is there anything traditional, throwing the old rule book, of what makea a good story work, right out the window. The stories that do get our interest hold it nicely, but there are way too many slow stories that don’t seem to go anywhere or push the movie forward. 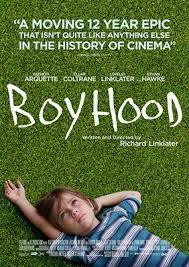 Boyhood is an extremely creative movie that actually feels like something we’ve seen before. That’s a weird statement, and sounds very contradictory, but the truth is we don’t really get how unique the movie is until we take a step back and examine it. This is a movie that was filmed over a period of something like ten years, following a boy from age eight or so to age eighteen. Every few years we join up with the boy and see what the latest thing is that is happening in his life. That’s the creative part. That we are actually watching the same actor and actress (his sister), age from being kids to being young adults. By the end of the movie, they are in college. It’s a very cool idea for a film, and it’s really interesting seeing the same face on the same actor and how it changes over time. But outside of that, the story itself has to also be good. In Boyhood it’s not bad, but at the same time, it’s not especially great, and it is definitely the biggest weakness of the movie. You see, there isn’t exactly a story. Not by any conventional measure. All of the elements that make good story, such as the rising action which builds to a conflict wiht suspense, the actual conflict, the resolution, the lessons learned, all of those things that we have come to expect to consider essential are not in this movie. There isn’t one story here, but instead, what one might call a series of short stories. And that would be fine, if they were actually short stories of different situaitons from this boy’s life. But in many cases they aren’t. They aren’t situations, but instead, just moments of no significance or meaning. Sure, not every moment in a person’s life is eventful, but that’s why we don’t make movies about such things. Those are the moments that nobody wants to watch, so we don’t subject them to it. It’s like what we tell people who are writing stories. There needs to be a problem. Without the problem, the story is just a simple account of a character doing the usual thing. The problem is what makes it interesting. But here, many of these segments don’t have any problem, which means they are just scenes of characters talking about everything and nothing. An example of this is when the boy, Mason, and his sister, Samantha, go with their dad to visit their grandparent’s farm. We watch the kids shoot off guns and skip rocks in the water, and there are some conversations, but there’s nothing to really grab or hold our attention. Now, luckily the whole movie is not like this. There is one segment in particular that is incredibly suspenseful. This is the part of the movie where the mother, (called Mom), played by Patricia Arquette, marries an alcohalic, and the man gets more and more abusive each day. First it’s just him hiding the bottle from them, but after a while it gets to the point where he is hurting the mother (off screen), driving drunk with a car full of kids, and throwing a glass at the table right in front of a kid, to the point where it shatters and explodes. That entire segment is great, because it’s scary and you don’t know what’s going to happen next. The problem is that it comes halfway into the movie, and that as soon as this character is gone, the movie suddenly becomes very slow. I understand that this movie was going for realism, but it probably should have focussed more on being interesting and gripping. If it had that in mind, than it might have brought this character back again for another part of the movie. 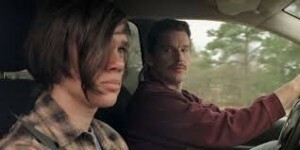 Maybe it would have had that man find them, after they ran away, and had Ethan Hawke’s character (the father) be the one to confront him. Instead, the movie is organized by chapters that might as well be based on the other characters who enter and leave their lives. There’s a lot of time spent with the kid’s father, and he’s got a relationship with his kids where he refuses to talk bad about their mother or the men in her life. Instead, he just offers lots of advice. There’s a point in this movie, towards the end, when Mason is taking photography in highschool, and it feels like every scene is a lecture. Like three adults, including the photography teacher who approaches Mason in the dark room at school, have advice to pass on to him. It gets to feel like too much. While the father, just like the mother, is interspersed throughout the film, a different chapter comes when there’s another man in the mother’s life, this one an army veteran who did multiple tours overseas. He waits on the porch for Mason to get home and then gives the boy a speech about responsibility when he misses his curfew by a few hours. Like other men in this movie who the mother dates, this one comes and goes. Considering how much this movie was supposedly about Mason’s life, it would have been nice to spend more time around his friends and get to know them a little bit. This movie is all about family, and that’s a shame, because friends are important too. I got to know the different friendships among the characters in American Pie better than I did the friends in this movie, and that film made time for relationships with parents as well. There’s really only one scene with Mason’s friends here, when he goes to an abandoned building one night to sleep over with his friend and his friend’s older brother. There are some other boys there too, and they do little more than stand around making fun of each other. There are moments in this scene that make it look like something bad is going to happen, but it never does. For all of my complaints, I did enjoy Boyhood. Some segments were certainly better than others, and the ones that worked, really worked. The scenes with the alcohalic step dad were terrific, of course, but so is an end segment where Mason goes to college and finds himself ditching an orientation mixer in order to go hiking with his new roomate and two girls. Both Ethan Hawke and Patricia Arquette are great in their roles as the parental figures, but there are large portions of the movie where neither one of them appears. That would be okay if something else, such as friends, were replacing them. Only here, in this movie, that doesn’t happen. And yet despite all this, most of the movie does work. There are definitely slow parts, but overall this film finds ways to keep our interest and attention.